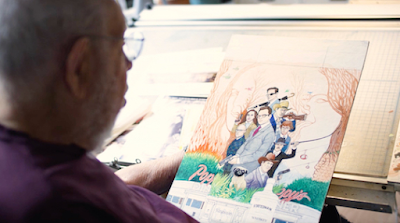 In celebration of the upcoming release of Kingsman: The Golden Circle, 20th Century Fox worked with legendary cartoonist Al Jaffee to create a custom illustration called the Golden Foldin'. Al is the creator of the iconic MAD Magazine "Fold-in" and holds a Guinness World Records title as the longest career comic artist, having worked continuously for 73 years. Still working like mad at 96 years old, Al Jaffee maintains a keen eye for detail and is an expert at subverting the viewers' expectations. Check out Al Jaffee's Golden Foldin' in the 9/18 print edition of the New Yorker magazine, and see the magic of Al's foldin' art in the Makin'-Of video below.